Nominations open for 2018-19 Butler Trust Awards! The dust may only just have settled on the Award Ceremony for last year’s winners, but nominations are now open for this year’s Awards! The Awards are presented by our Patron, HRH The Princess Royal, and help give credit where it’s due to people who go above and beyond in their work in prisons, probation and youth justice settings (including volunteers and third-party employees) – and just being nominated shows someone’s efforts have not gone unnoticed. You can find more about the Awards, and how to nominate someone, in the Awards section of this site. And you can view a short video here. Our highest ever number of nominations! 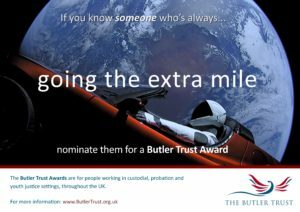 Butler Trust Nominations close on 30 June! 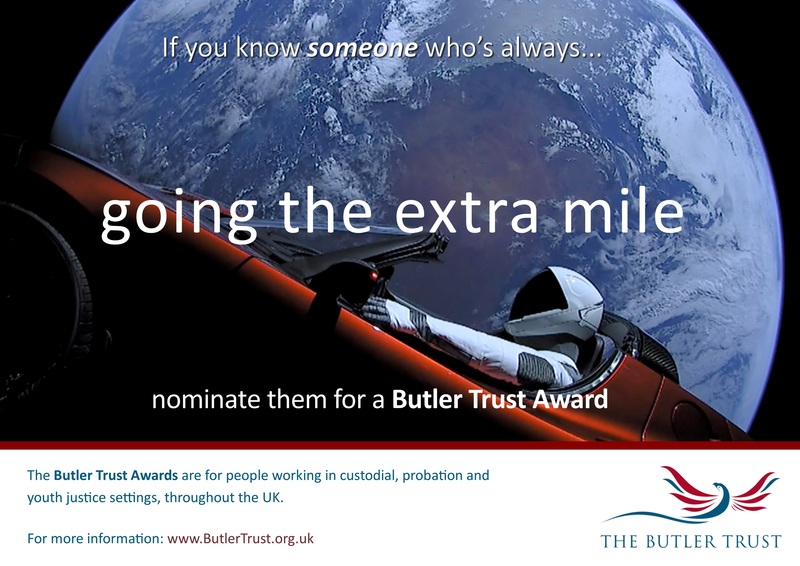 The Butler Trust recognises, celebrates, develops and disseminates outstanding work and best practice across UK prisons, probation and youth justice. The Trust is a registered charity, set up in 1985 and named after reforming former Home Secretary, “RAB” Butler.